Portrait of Captain Thomas Dowdeswell by Joseph Blackburn ~ The History Girl! The British Army and its hired German auxiliaries (Hessians) gathered on Staten Island throughout the summer of 1776 in preparation for their campaign to seize New York City. Among the detachments poised to attack the city was the British Army’s newly established Brigade of Guards. Captain Thomas Dowdeswell was an officer in Brigade. Dowdeswell had his portrait painted when he returned to England wearing his uniform and carrying the weapons he used to fight the rebels. Portrait of Captain Thomas Dowdeswell by Joseph Blackburn, 1777. Another interesting detail is that Captain Dowdeswell is armed with a musket, a weapon usually carried by common soldiers. British officers traditionally carried swords and not muskets the loading and firing of which was believed would detract them from their duties. 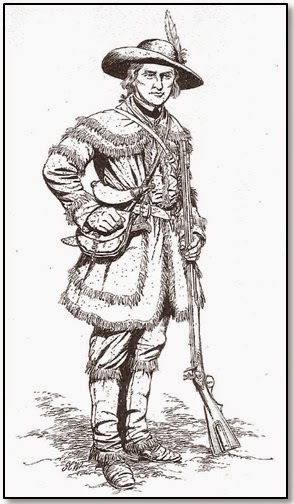 Dowdeswell is armed with a light weight musket called a fusil (also spelled fusee) which is fitted with a bayonet. Some British generals were opposed to having officers carry muskets. Among the critics was General Sir Henry Clinton who said, … I have often represented the absurdity of officers’ being armed with fusils, and the still greater impropriety…by which they neglected employing their divisions to advantage.2 Dowdeswell should also be wearing an epaulet on his right shoulder indicating that he was an officer. Looking at this portrait some historians believe that Dowdswell’s appearance was meant to disguise that he was an officer. To explain, apparently, the insurgents purposely aimed at officers at Bunker Hill (June 1775) who could be identified by their shoulder epaulets, swords and coats with gold buttons and lace trim.3 A few months later, back country volunteers arrived at the rebel camp from Virginia and Pennsylvania armed with accurate, long-range rifles. These woodsmen learned to kill the officers first from the Indians who used the tactic to create confusion and panic within their enemy’s ranks. The practice of targeting officers was considered barbaric by the British who threatened to hang any rebel riflemen they captured. To further deal with this threat, officers were made to look indistinguishable from the enlisted men they commanded. American Rifleman, Arthur Lefkowitz Collection. However, some historians point out after studying Dowdeswell’s portrait, that it was apparent he was an officer. The clues were that officers, including Dowdeswell wore better quality clothing and their tailored regimental coats were of a richer and darker red color than those issued to common soldiers.4 Dowdeswell is also wearing distinctive gold washed buttons and gold trimmed lapels. Also favoring that Royal officers were not purposely targeted is that the estimated total number of British officers killed and wounded during the American Revolution is in proportion to other wars of the period. Dowdeswell is also wearing a gorget around his neck and a sash around his waist. These devices further identified him as an officer. Note that his sash is tied on the left side to show that he was an infantry officer. However, it is possible that he removed these items (dressed down) in combat. Whatever one’s point of view, Dowdeswell’s portrait shows a British officer wearing practical clothing and armed with a musket and bayonet to defend himself and to add firepower in combat. Blackburn arrived in Boston in 1754, where he painted the portraits of affluent residents. He was probably the best artist working in America during the 1760’s. However, his greatest contribution to American art was his connection in Boston with the young and brilliant American painter John Singleton Copley. There is no evidence that Copley studied with Blackburn, but the youthful American was influenced by Blackburn’s compositions including his graceful poses and elaborate backgrounds. Blackburn returned to England in 1763 where he worked in the provincial market away from urbane London where more fashionable artists including Thomas Gainsborough and Joshua Reynolds commanded the best commissions. Although the back of the Dowdeswell portrait is marked 1776, it is believed that it was painted in 1777 following Dowdeswell’s returned to England from service in America. 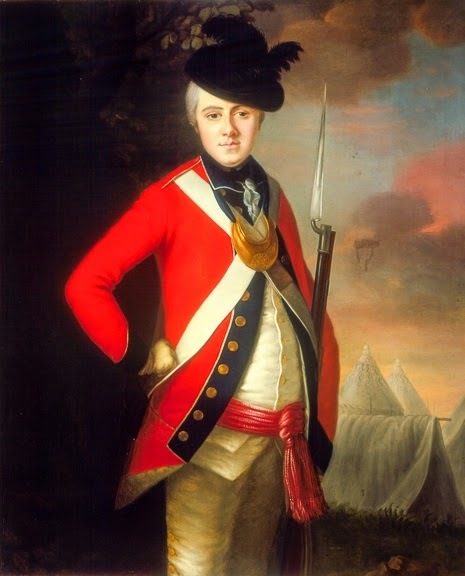 Dowdeswell resigned from the British Army in June 1778 and there is no known information about his later life. The date of Blackburn’s death is also unknown but he is believed to have died in 1778. The Portrait of Captain Thomas Dowdeswell by Joseph Blackburn (1777) is in the collection of the Mount Vernon Ladies Association, Mount Vernon, Virginia. 2 Clinton added that he felt it was, an inconvenience which I had long apprehended might result from the officers’ carrying fuzees, [fusils] which was then and had been the general practice in the American service. 3 See for example, Nathaniel Philbrick, Bunker Hill, (New York: Viking Press, 2013), 220. Philbrick quotes a rebel defender who was instructed to take particular notice of the fine coats. Writing to James Warren (a prominent Massachusetts patriot) from Philadelphia on June 27th, 1775, John Adams said, We are sending you, Ten Companies of Rifle Men….they have Sworn certain Death to the ministerial officers. May they perform their oath. Paul H. Smith, ed., Letters of Delegates to Congress 1774-1786. 26 vols., (Washington, D.C. United States Government Printing Office), Vol. 1:545. 4 Officers and sergeants wore redder coats made from the dye of crushed beetles. Common soldier’s coats were dyed from the madder plant which created a darker red- brown color. 5 Worcester Art Museum website www.worcesterart.org. ; Joseph Blackburn artist page. The Worcester Art Museum collection includes three portraits painted by Blackburn.